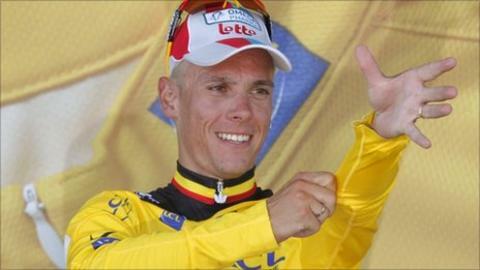 Belgium's Philippe Gilbert won a thrilling and incident-packed opening stage of the 2011 Tour de France. Gilbert raced away on the uphill finish of the 191.5km leg through the Vendee region to take the yellow jersey. Defending champion Alberto Contador of Spain was delayed by a pile-up 9km from the finish and is 80 seconds adrift. Australia's Cadel Evans was second while Britain's Geraint Thomas (sixth) and Bradley Wiggins (50th) were awarded the same time and are six seconds back. The three other Britons in the race, David Millar (16th), Mark Cavendish (69th) and Ben Swift (70th), were also credited with finishing six seconds behind the winner and with Sunday's team time trial next up, all five are in with a realistic chance of finishing the weekend wearing the yellow jersey. Team Sky, which contains Thomas, Wiggins and Swift, are expected to do well in Sunday's 23km stage around Les Essarts and the Welshman, who is blogging from the race for BBC Sport, said: "The team time trial is what I enjoy. "It's like what I've been doing on the track - it's very similar to the team pursuit - and I can't wait for it. "Obviously we've got a great team for it and we just want to get out there, give it our best, ride it well and hopefully that'll be enough to win the stage. We've got a great chance." The traditional Tour de France opening prologue stage, a short individual time trial, was ditched in favour of a longer leg by race organisers in an effort to provide a more exciting opening to this year's Tour and give more riders an opportunity of victory. To try to involve sprinters in more than just the stage finish, organisers have also decreed that each stage will have only one intermediate sprint, putting 20 green jersey points on offer for the first man over the line and judging by the opening stage, their plan appears to be working. A three-man break jumped out of the peloton immediately after the ceremonial start across the Passage du Gois causeway on the Atlantic coast. French duo Jeremy Roy and Perrig Quemeneur and Dutchman Lieuwe Estra were allowed to open up a six-minute lead by the chasing pack and the trio were first through the day's intermediate sprint after 87km - Roy collecting 20 points for first place. A huge sprint ensued for the fourth place which was won by Garmin rider Tyler Farrar, who collected 13 points, with Andre Greipel fifth. Britain's Cavendish appeared to sit up after being passed by Farrar and he finished in 11th, to collect five points, one more than last year's green jersey winner Alessandro Petacchi. The opening stage will be remembered, though, for its crashes. Jurgen van de Walle suffered cuts in a heavy fall early on in the stage but the Omega Pharma-Lotto rider was soon back in the saddle and leading the peloton, blood dripping down his leg and arm. However, the most decisive coming together came with 9km remaning when an Astana rider clipped a spectator who was looking the wrong way and around two dozen riders were sent tumbling onto the Tarmac and into the roadside ditches. Among those delayed by the crash was Contador, who would eventually finish 82nd. Wiggins and twice runner-up Andy Schleck escaped that initial collision but they were among a group caught up in another accident nearer the finish. However, as that crash was within three kilometres of the line, they were credited with the time of third-place finisher Thor Hushovd. Nobody was going to catch Gilbert though. The 28-year-old, who in 2011 became only the second man to win all three of the Ardennes Classics in the same year, powered his way up Mont des Alouettes, holding off attacks from Alexandre Vinokourov and Fabian Cancellara. "To win here in the Tour de France is something special," said Gilbert. "I've never won any stages. I've never had this yellow jersey before so, for me, it's a very good day." 2. Cadel Evans (Aus/BMC Racing) +03"
3. Thor Hushovd (Nor/Garmin) +06"
16. David Millar (GB/Garmin-Cervelo) +06"
82. Alberto Contador (Spa/Saxo Bank) +01'20"